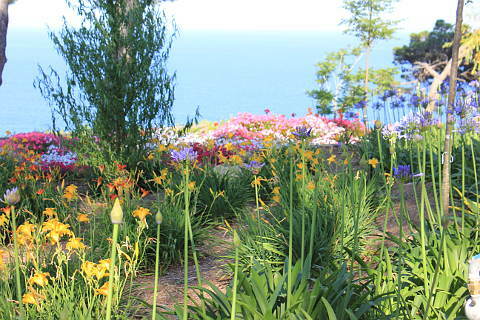 The Jardins de Cap Roig are stunning gardins next to the lovely seaside village of Calella-de-Palafrugell in the province of Girona in the Catalonia region of Spain. 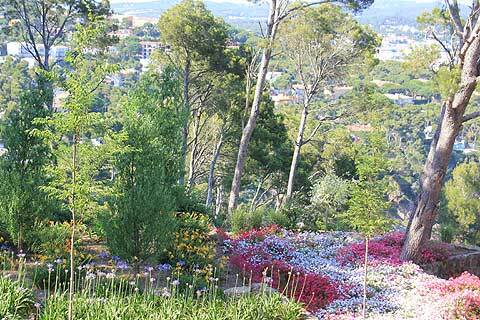 The gardens are the location of the annual Cap Roig festival. 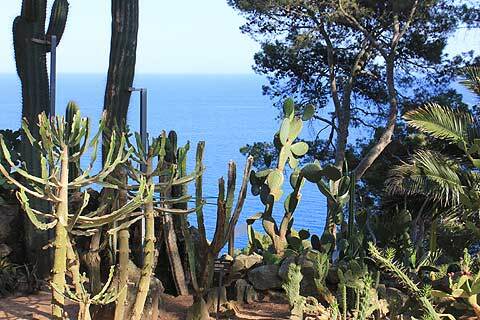 Just a short distance from the centre of Calella de Palafrugell are these fabulous gardens. In 1927 Russian colonel Nicolai Woevodsky, an architect, and English aristocrat and garden enthusiast Dorothy Webster started creating their dream garden and the result is superb. 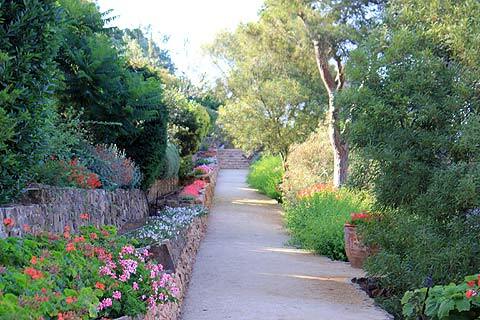 The garden hugs the top of the cliff overlooking the beautiful El Golfet beach and cove below. The combination of beautiful garden, fabulous views and the attractive medieval-style castle that sits in the gardens makes this one of the best gardens I have visited. At the entrance to the garden is an arched entrance covered in a bright pink bougainvillea setting the scene for the feast of colour to come. 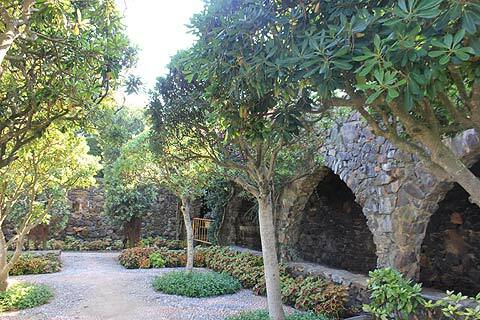 Through the entrance is the Palm garden and first sight of the views over the sea and the Formigues islands. The garden itself covers 17 hectares and has nearly 1000 botanical species which have been planted to ceate 22 different sections to the garden - each one beautifully planted and leading naturally on to the next section of the garden. As well as huge swathes of plants which become more beautiful because of the sheer numbers involved, a lot of attention has been given to scent too and walking through the garden the scents of the plants were delightful. A rocky headland juts into the sea and the garden has excellent viewpoints on eitherside of this - one side giving view over the Formigues islands and the other Calella and the Sant Sebastia lighthouse can be seen. In 1969 the Woevodsky's gave the estate to the "la Caixa" Welfare Projects on condition that it is conserved and maintained. As well as enjoying the gardens there is a sculpture park and an annual music festival to ensure the funds to keep the estate going. What a spectacular venue for a concert! Over July and August every year a concert stage is set up in the gardens and over the course of the two months more than 20 music concerts take place. In 2012 the festival includes Bob Dylan, James Morrison and Simple Minds. The Cap Roig Festival is the biggest music event on the Costa Brava and its setting could not be beaten. 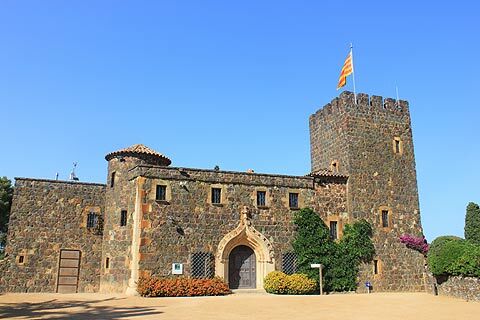 The Castell i Jardins de Cap Roig are situated just south of the lovely seaside village of Calella de Palafrugell. 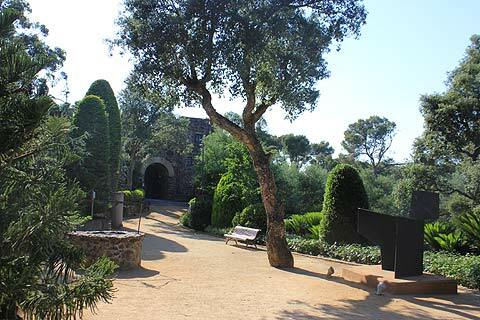 The Cap Roig gardens and Calella are on a lovely stretch of the Costa Brava called the Baix Emporda and very close to Calella are two of the loveliest resorts on the Costa Brava - Llafranc and Tamariu. 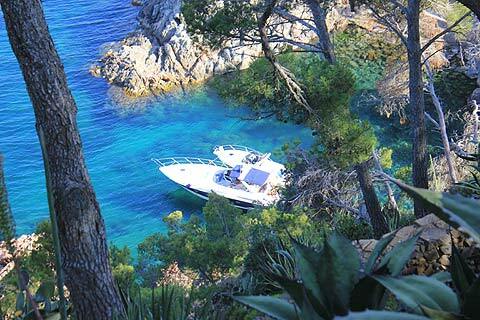 Llafranc is an up-market resort with a marina and excellent, though expensive, restaurants. Tamariu is named after the pretty tamarind trees lining its seafront promenade.